For many families and individuals in Philadelphia, food pantries are the only means of reliable groceries throughout a given month. For many of these same people - up to 70% according to a recent survey by the Coalition Against Hunger - chronic illnesses (like diabetes, and heart disease) dominate their lives. Nutrition can play a major role in managing these disease, but there is a disconnect when it comes to the standard items available in most food pantries. Non-perishable foods are often highly processed and high in sodium and sugar. 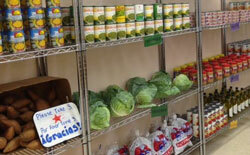 The Coalition Against Hunger's Green Light Pantry project takes aim at this problem, and at two model sites in Philadelphia the, Drueding Center and Casa Del Carmen, a new kind of food pantry is taking shape, a creative alternative that focuses on distributing healthy options to clients. Through a partnership with the SHARE food program, lean proteins, low-fat dairy, fresh produce, and lower-sodium canned goods are available. Instead of being given a pre-packed box or bag of food, clients are able to shop for what they need, as in a grocery store. This helps those who have certain dietary restrictions or allergies avoid bringing home products they can't use. Complimentary resources, such as nutrition classes, info on SNAP enrollment, and medical screenings are also regularly held at both sites. Julie Zaebst, interim director at the Coalition Against Hunger says that hopefully, these two sites are just the beginning. "We want to learn what the challenges are and see where further improvements can be made. Our hope is to identify best practices that we can easily share with other pantries, but some components will be resource-heavy. Unfortunately, some healthy options are a lot more expensive." While Stroehmann Bakeries, Citizens Bank Foundation and the Pincus Health Foundation are current sponsors, they hope to secure more funding in the future to convert other existing sites into Green Light Pantries, so that even more Philadelphians can have access to groceries that they can feel good about cooking with, no matter what health issues they or their families are facing.